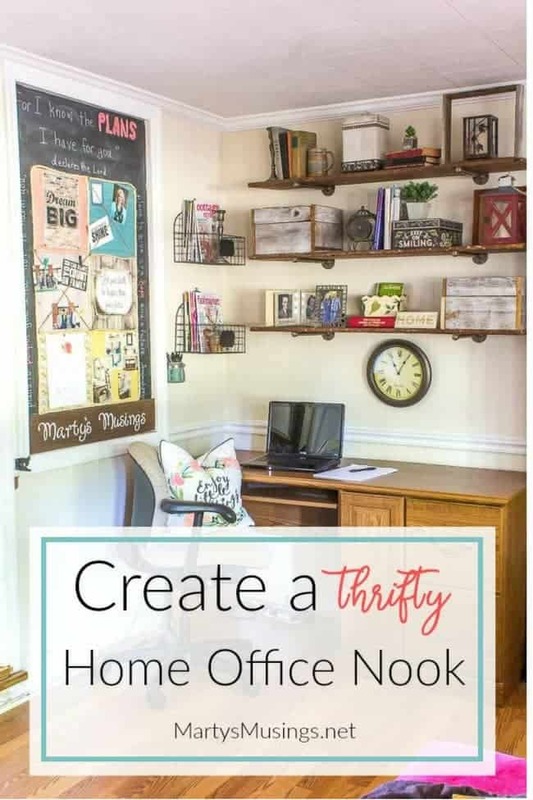 Create an organized and thrifty home office nook in your home with these simple tips on organizing your office space, time AND your life! It seems everyone wants to work from home these days. Leisurely mornings, cup of coffee in one hand, checking emails on the cell phone with the other. 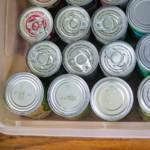 Checking off to do lists with efficiency and speed while juggling schedules and family needs. That’s the sound of reality interrupting the daydream. More than likely if you’re a work from home mom boss/entrepreneur/juggler of many balls in the air, you jumped out of bed today, frantically began to get the kids ready for school, lunches packed, pets fed, a load of laundry started, dinner in the crockpot and on and on until you fall exhausted into bed tonight. I feel your pain, not because this has always been my life, but because most women I know burn the candle at both ends. Whether you stay at home raising your kids, work full time outside the home or seek desperately to find a balance somewhere in-between, life is busy and stressful. 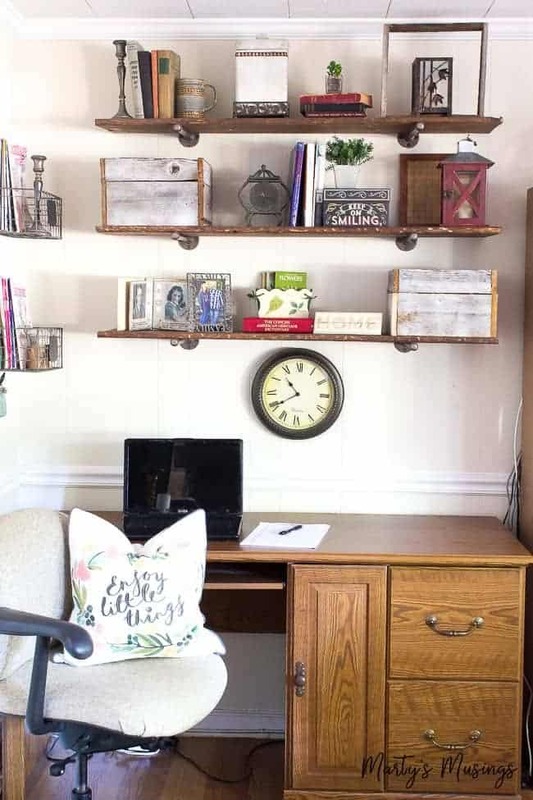 Since we’re all in this together I thought I’d share a few ideas for those of you who might need some extra motivation and inspiration as you work from home (or dream about it!) 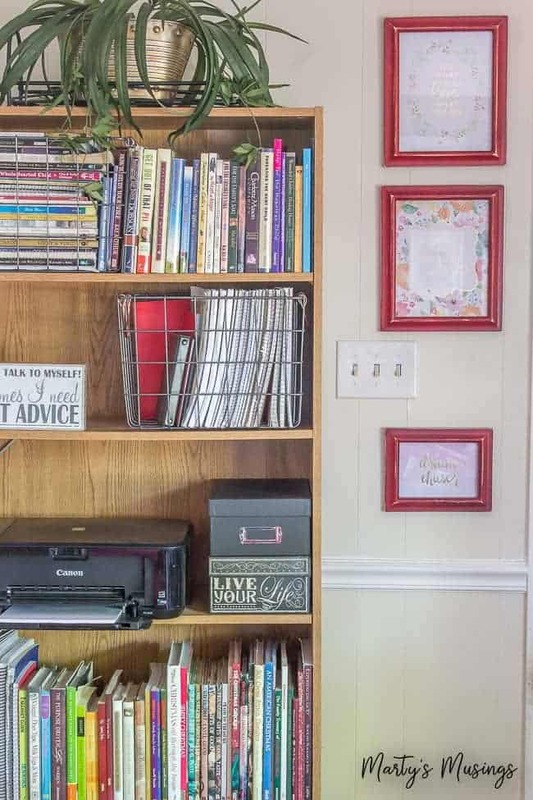 There’s definitely been a learning curve for this former homeschool mom turned business woman. 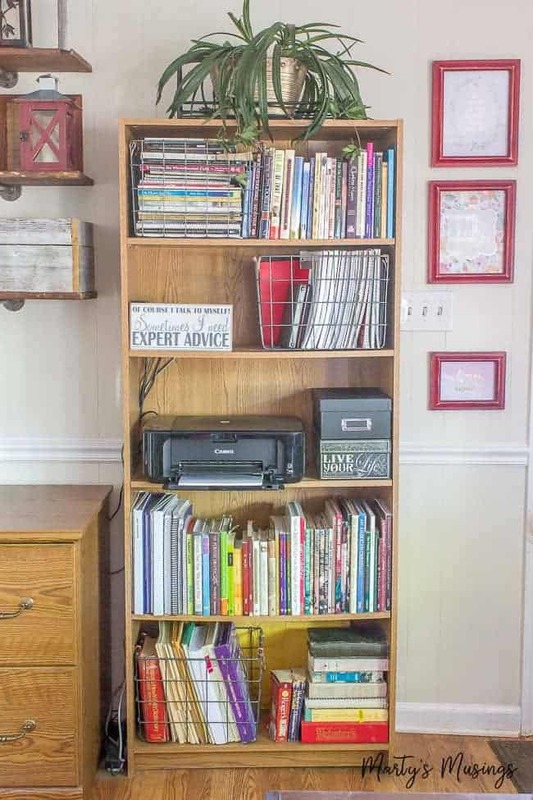 Or maybe you just need some help prettying up your school area or home file storage. I think you’ll find tips and suggestions for all of these and more! 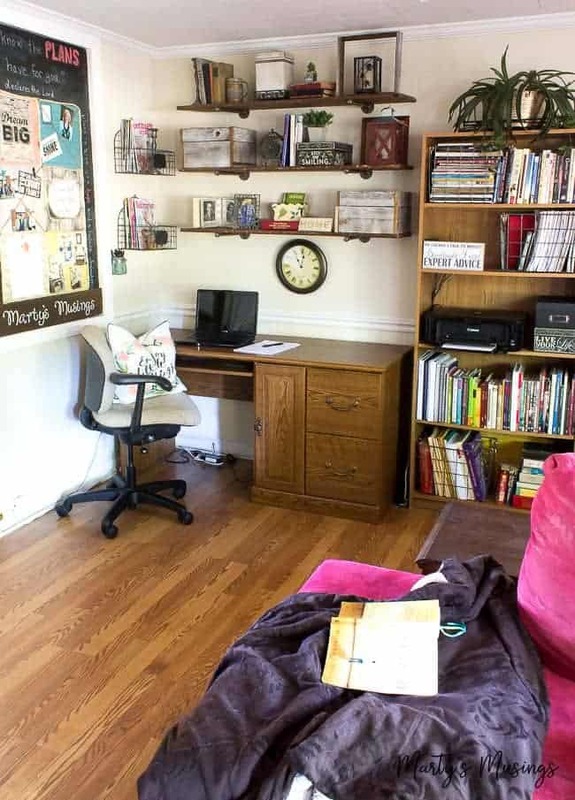 I’ve already shared a couple of projects from my home office nook (How to Build Industrial Pipe Shelves and Make New Wood Look Old and my DIY Bulletin Board) but I wanted to show you the entire small space in my den. Let me remind you where we started. 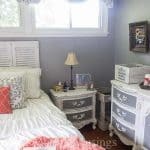 You can read more here about how we found this space 28 years ago (cue the really UGLY picture in that post) and created a fresher, more efficient use of our small space. Quite a change don’t you think? 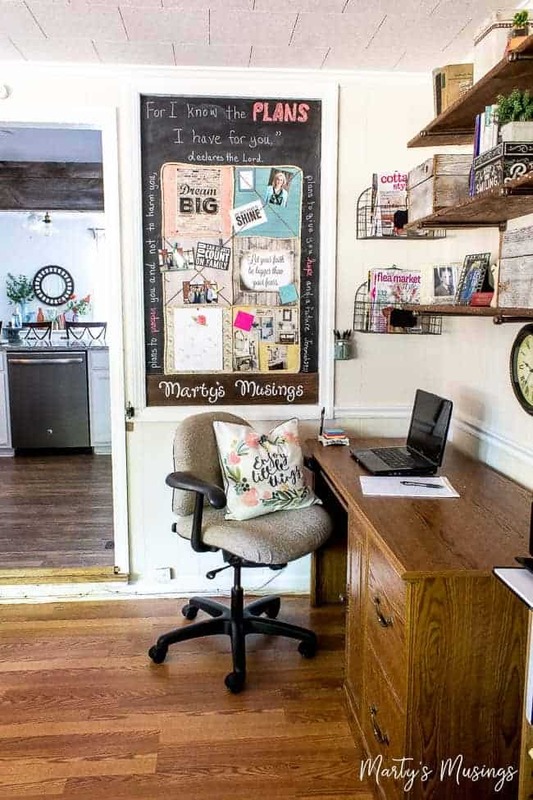 You might be wondering: what’s the big deal about this work at home deal? Sounds like a piece of cake. I’m gonna confess from the get go that this is a hard one for me. After years of flexibility as a stay-at-home mom, finding a routine that works has been challenging. Yet it’s also a necessary piece to the puzzle of keeping your business, home and life moving forward. 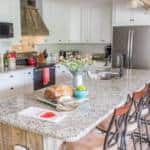 Routines create consistency for everyone involved and help make sure you get the things done that are important…..like finishing those projects and spending time with those you love! When I dress the part of a business woman I respect myself and take my job more seriously. I’m not talking dresses and heels, but sometimes clean jeans rather than dirty yoga pants is a step up! Is it just me or can hours go by with seemingly nothing getting accomplished? I’m a pretty driven person by nature and I place fairly high expectations on myself. However, I’m just as easily drawn into the social media abyss as the next person. Respect your time limitations and stay off social media unless you’ve added it to your daily schedule. I’m preaching to the choir here, y’all. I can use the excuse all day long that “it’s part of my job” as a blogger/website owner/mompreneur. But we both know we’re scrolling feeds looking at the pretty food, reading the latest drama and seeing whose kid did better than ours. Stay focused and prioritize your to do lists. You only have so much time in the day. Make the most of it. I don’t know about you, but I work better when my eyes are resting on something beautiful and creative around me. 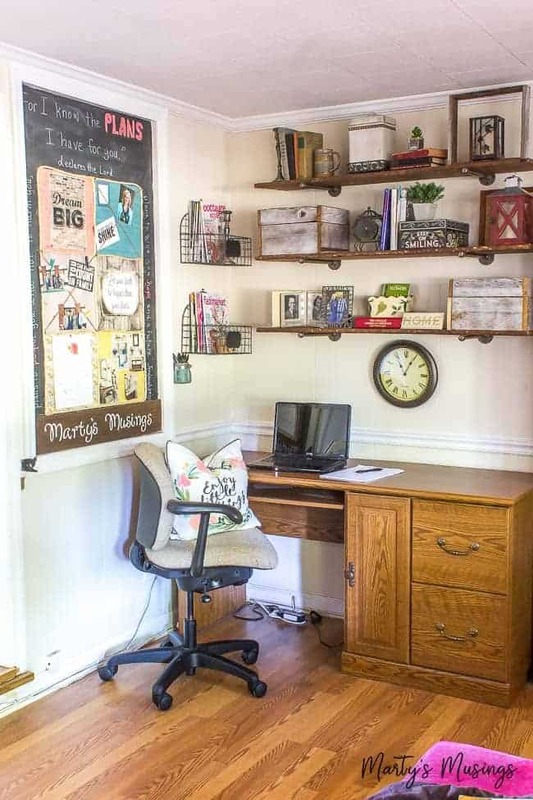 One of the best parts of my small home office nook is this built-in DIY bulletin board. 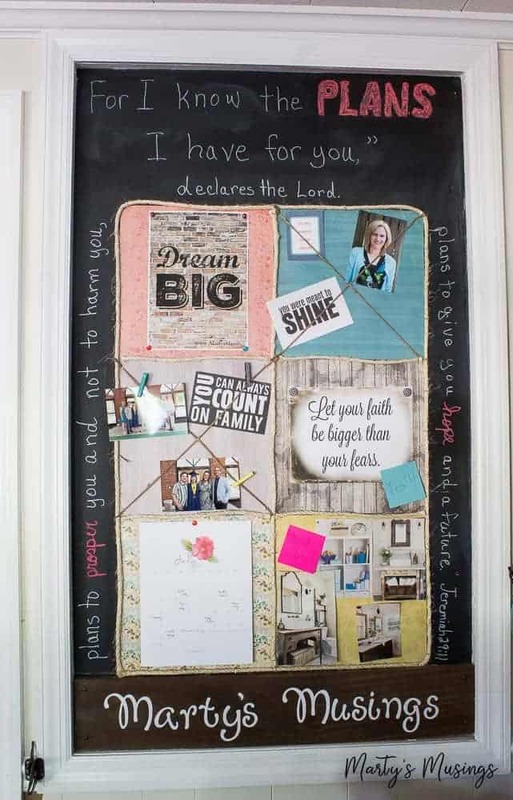 I keep quotes, ideas, family photos and my life verse as a reminder to focus on my goals and remember why I do what I do. 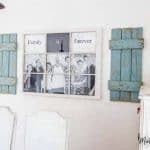 This wall decor was put together from an inexpensive stack of frameable quotes in $1 yard sale frames that I sanded just a touch to look distressed. I chose words that would inspire and encourage me to work harder. Think about what you want in your space. Is it bright colors (to keep you awake, lol!) 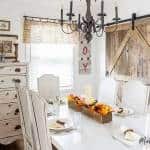 or subtle floral patterns, a touch of modern or rustic accessories? I don’t deal well with clutter. 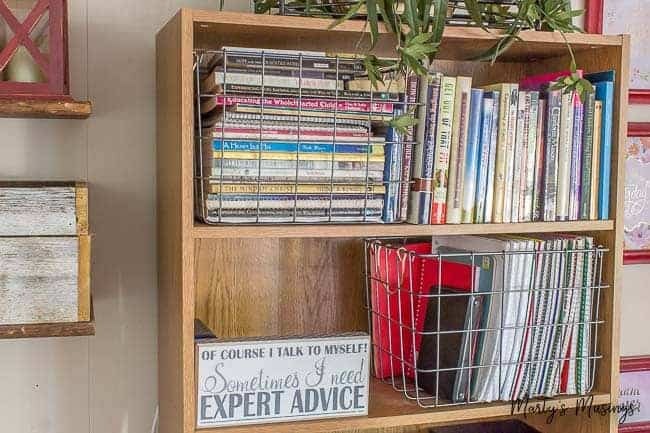 It messes with my ability to focus on the task at hand so I try to store items in an attractive way or keep them out of sight. 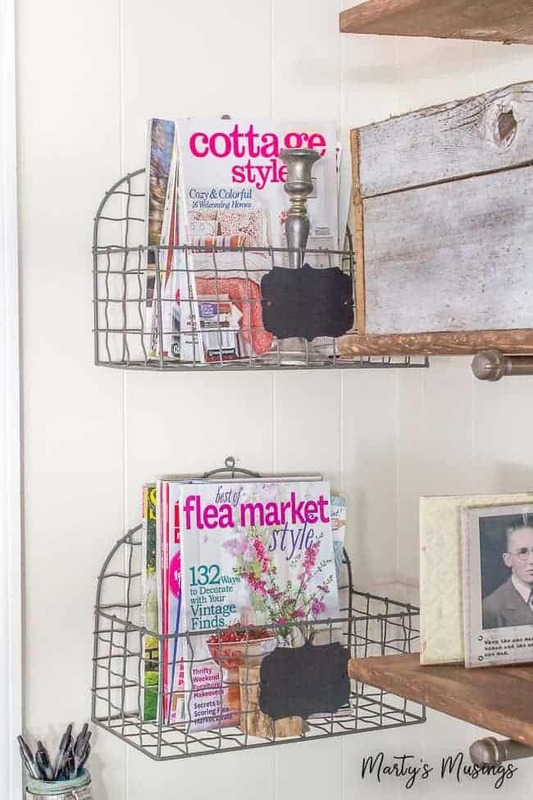 I used these metal baskets to store books and notebooks as well as copy paper and empty file folders. 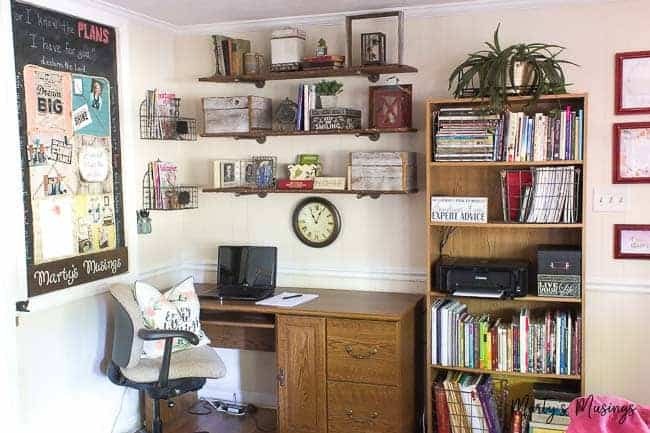 Remember you still have to work in your space but whenever possible hide the ugly if you can! I used a cute little wooden plaque to hide our router and those photo boxes hide envelopes and other office supplies. So much easier said than done but whatever stage of life you’re in, it’s worth remembering! 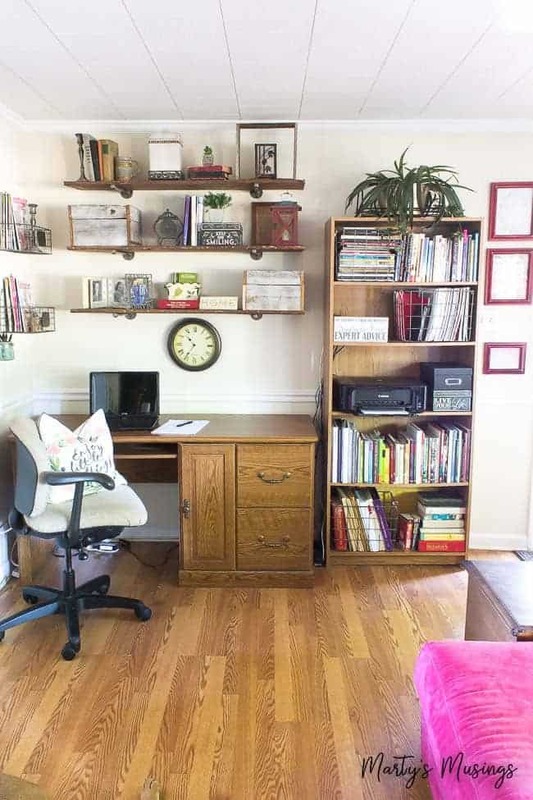 Most of the items I used for my home office nook were purchased on sale but I wanted to include some links to similar office decor items you might like! Love this post! It isn’t always easy to stay focused. My newest strategy is to “try” to batch work. So I will have a day where I only work on posts for my blog, or a freelance client, or whatever. It helps me to stay focused and get more done. Also, a wireless laser printer is seriously a LIFESAVER and has been such a great addition to my home office. I used to have an inkjet and it was ALWAYS crapping out, out of ink, etc. Having a legit printer that actually works well is such a wonderful addition. I’m not troubleshooting or buying expensive ink all the time. It sounds silly but it’s been such an upgrade for me. Hi, Kim. 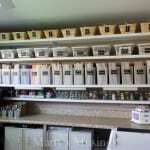 I love the idea of doing batch work. I just haven’t been able to implement it yet, or at least only in small snippets of the day. We’ve never done the laser printer but I’ll have to keep that in mind. I’m all about saving time these days! Love this post! 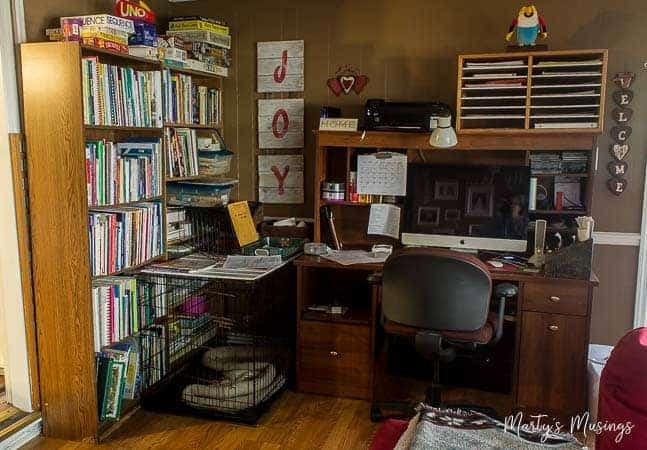 Has inspired me to get my own home office in order. Thank you once again for sharing your wonderful ideas! Thanks so much, Mitra! It takes work to keep an office in order doesn’t it? I’m glad I inspired you a little bit and good luck, my friend!